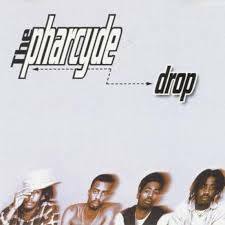 “Drop” by The Pharcyde was released in 1995 as the first single off the group’s second album, Labcabincalifornia. The single contains a vocal sample of the Beastie Boys song “The New Style”, using the titular “mmm….. drop” line delivered during a drop to create its hook. The music video for “Drop” was directed by Spike Jonze and filmed in Los Angeles. The video features footage of the group performing the song backwards, replayed backwards, which when combined with the chopped, spacey beat of the song gives the video a slight surrealistic quality. The group also worked with linguistic experts to recite the entire song backwards. Ad Rock and Mike D of the Beastie Boys make a brief cameo.